Photograph collection of webmaster. 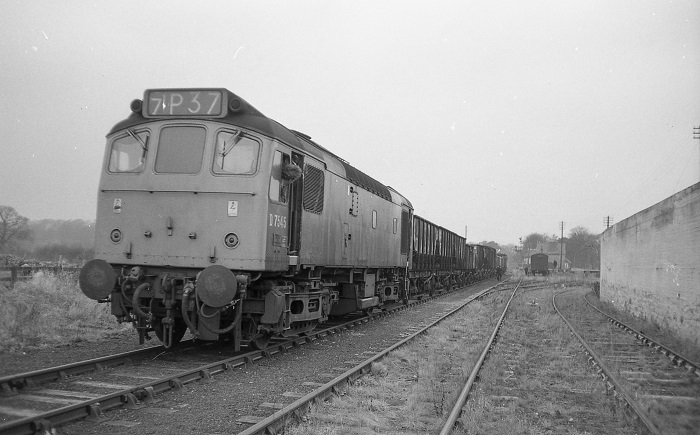 D7545 shunting wagons for Hartley Quarry circa 1969. The train is on Merrygill Viaduct, the quarry is off to the right barely visible through the haze. The twenty year one month career of D7545/25195 included allocations to many London Midland Region depots with a predominance to the north-west. Jointly 25119, 25195 & 25302 were the 4th longest surviving vacuum braked Class 25s (exceeded only by 25042, 25080 & 25224). January 1969 to Preston Division (D10). July 1970 to Manchester Division (D09). July 1971 to Manchester Division (D09). May 1980 to Springs Branch. 25195 was the 248th Class 25 to be withdrawn, one of seven retired during June 1985. After withdrawal 25195 was stored at Toton until March 3rd 1986 when it was moved (see details below) to Doncaster Works. On August 15th 1986 it was moved to Goole Docks for temporary storage. After being sold to Vic Berry, Leicester it remained at Goole Docks until October 29th 1986 when it was moved to Leicester Humberstone Road and into Vic Berry's yard the next day. 25195 was broken up during December 1986 although the cabs lingered until at least November 1987. Noted Derby Works September 1978 (Classified repair). Photograph collection of webmaster. 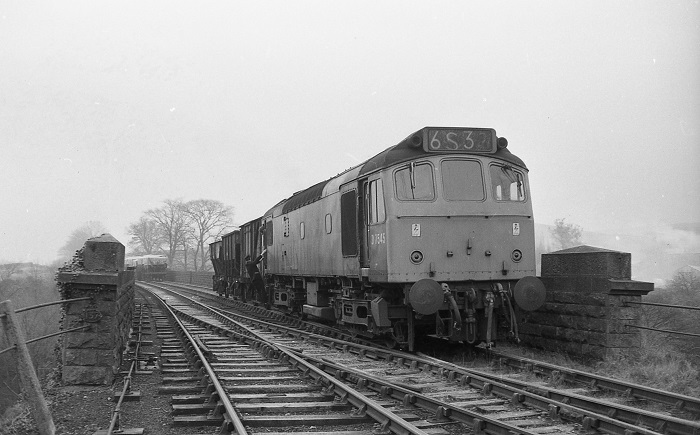 D7545 at Warcop with traffic for the MOD sidings and for Hartley Quarry, date unknown but circa 1969. The 20.33 Carlisle - Perth on July 22nd was worked by 7545. On June 7th 25195 & 25148 worked the 09.20 Manchester Piccadilly - Yarmouth to Lincoln Central returning with the 09.30 Yarmouth - Manchester Piccadilly. The next day (7th) 25195 worked the 22.05 York - Manchester Victoria. The 09.20 Manchester Piccadilly - Yarmouth on June 12th was worked by 25195 & 25182 to Lincoln Central, the return working was handled by 31176 after the Class 25s were failed. No passenger workings have so far been noted for 1977. On June 3rd the 09.19 Manchester Piccadilly - Yarmouth was worked by 25195 & 25136 to Lincoln Central returning with the 09.15 Yarmouth - Manchester Piccadilly. On June 17th 25195 worked the 07.30 Nottingham - Llandudno Town forward from Derby. 25195 & 25161 came to the assistance of the 'The Marches Venturer' steam railtour on October 7th when ex-GWR King No.6000 failed with a hot box, the Class 25s working forward from Shrewsbury to Chester and on a later leg down to Hereford having replaced 7029 (see image below). Photograph courtesy Bernard Mills. 25195 & 25161 at Chester on October 7th 1978. The recorded passenger workings for 1979 all feature the Cambrian line. On June 17th 1979 25195 & 25280 worked the 08.45 Birmingham New Street - Barmouth and the 17.45 Barmouth - Euston to Wolverhampton. Just over two months later on August 25th 1979 25159 & 25274 worked the 10.10 Euston - Aberystwyth from Birmingham New Street, returning with the 16.10 Aberystwyth - Shrewsbury. Photograph courtesy John Powell. 25195 fills the scene as it heads west through the Penmaenmawr station with a mixed freight on May 18th 1979. On May 21st 25195 was noted at Earlestown hauling D1062 sandwiched between two brakevans presumably en-route to the Rainhill festivities?? On April 1st 25195 hauled 40110/116 from Springs Branch to Gloucester, picking up 40032 in the Manchester area and destined for Swindon Works. On July 17th 1981 the 18.15 Birmingham New Street - Norwich was booked for 31418 which was failed before departure, 25195 took over and was noted still on the train east of Peterborough. During August 25195 received an 'E' examination at Reddish. 25195 was noted at St Neots on the morning of September 29th working a trip freight. 25195 was in charge of a rake of empty ICI hoppers on the Northwich - Tunstead route on May 27th. On July 27th 25195 worked the 07.09 Bangor - Manchester Victoria, the 10.45 Manchester Victoria - Holyhead and the 15.17 Holyhead - Manchester Victoria. On August 30th 1982 the return leg of a mystery excursion from Llandudno Town saw 47236 failed on departure at Skegness, 25195 & 25193 dragged everything to Derby. The next day (31st) 25195 worked the relief 15.10 Crewe - Llandudno Town. About a month later on September 28th 1982 the failure of 45150 on the 15.10 St. Pancras - Nottingham at Wellingborough saw 25195 drag everything to Nottingham. The next day (29th) the 15.12 Manchester Piccadilly - Grantham was worked by 25195 and terminated at Grantham because of a rail strike in Anglia. On a wet February 7th 25195 was noted eastbound through Manchester Victoria was a lengthy train of hoppers. 25195 was on coal duty in the Manchester area on April 16th, with one wagon delivering bagged coal to the signalboxes in the Miles Platting area. 25195 was stabled at Crewe depot on May 2nd. 25195 was noted at Cwmbran working the 4V20 15.10 Manchester Piccadilly - Bristol Temple Meads parcels on May 3rd. 25195 was stabled at Bescot on May 31st. 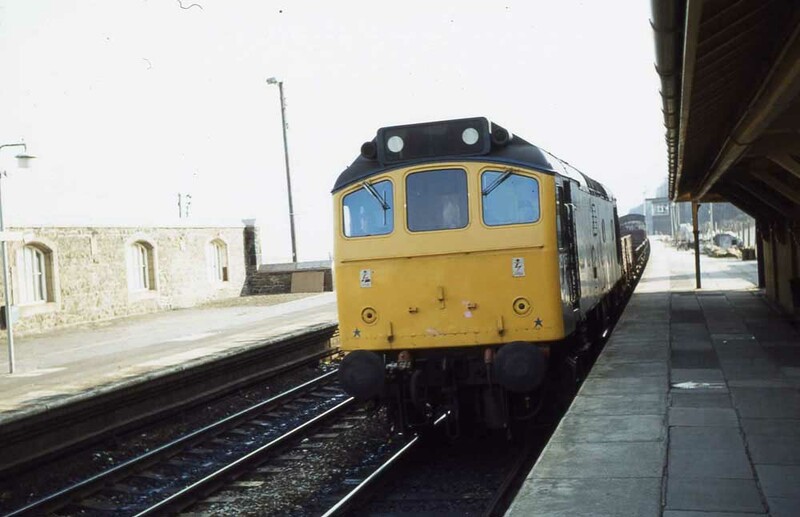 Engineering work on June 13th 1983 saw the 21.35 Bristol Temple Meads - Edinburgh dragged between Crewe & Preston by 25195 & 25185, and then doing the same southbound for the 23.06 Edinburgh - Bristol Temple Meads. A month later on July 13th 1983 25195 worked the 18.38 Blackpool North - Birmingham New Street to Preston. On September 5th 25195 was noted passing Llanwern with empty hoppers. Track alterations at Ilkley saw a ballast special worked by 25195 & 25306 on October 9th. The next day (10th) 25195 was noted working a Walton Junction to Healey Mills freight. On November 22nd 1983 25195 worked the 06.45 Derby - Leicester and the 07.48 Leicester - Leeds to Nottingham. A diesel multiple unit failure on February 2nd 1984 saw 25195 assist the 09.44 Manchester Victoria - Liverpool forward from Eccles. A diesel multiple unit failure on April 27th saw 25195 assist the 18.20 Liverpool - Preston from St. Helens Shaw Street (also reported as from Wigan). On May 2nd 25195 was noted at Edge Hill with a short engineers train. 25195 was noted passing Cwmbran with a block train of anhydrous ammonia (ten tankers plus two barrier vehicles and brake van) for Avonmouth on May 11th. 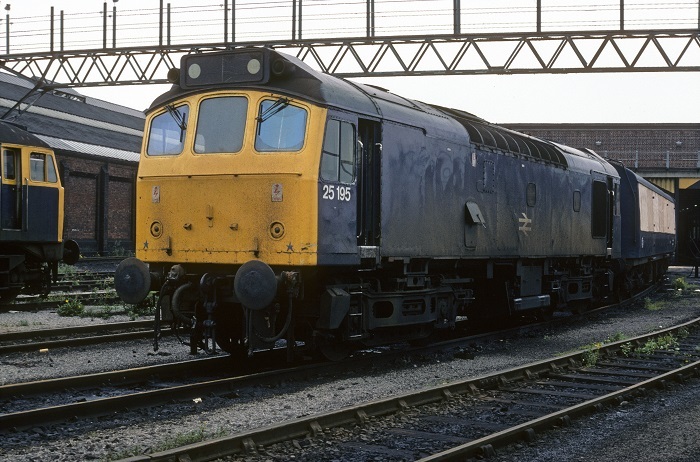 June 4th 1984 saw 25195 work the 20.15 Manchester Piccadilly - Cleethorpes as far as Sheffield, returning with the 22.33 Sheffield - Manchester Piccadilly. 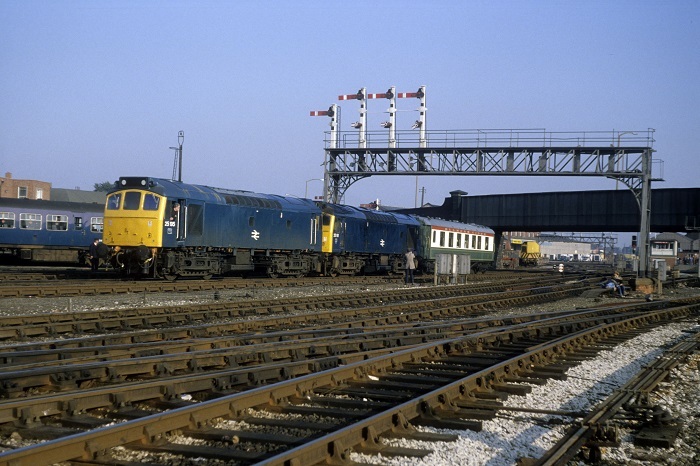 Five days later on June 9th 1984 the 10.10 Euston - Shrewsbury was worked forward from Wolverhampton by 25195 & 25037. Photograph courtesy Roger Geach. 25195 at Longsight depot on June 6th 1984. On July 3rd (?) 25195 & 25042 worked the 8F21 12.40 BIS Oakamoor - Wigan Springs Branch Junction Sidings sand train with portions for the United Glass Works, St.Helens, then to Wigan for the Co-op Glass Works. Two days later (5th) 25195 & 25042 were shunting empty HJV mineral wagons at Longport. On July 22nd 25195 was stabled at Newton Heath. The last day of August 1984 saw the 12.30 Birmingham New Street - Peterborough fail at Leicester behind 31152, 25195 took the train forward to Peterborough, returning with the 17.20 Peterborough - Birmingham New Street. Finally for 1984 a Southport - Manchester Victoria was worked on September 12th. 25195 was stabled at Buxton on October 27th. 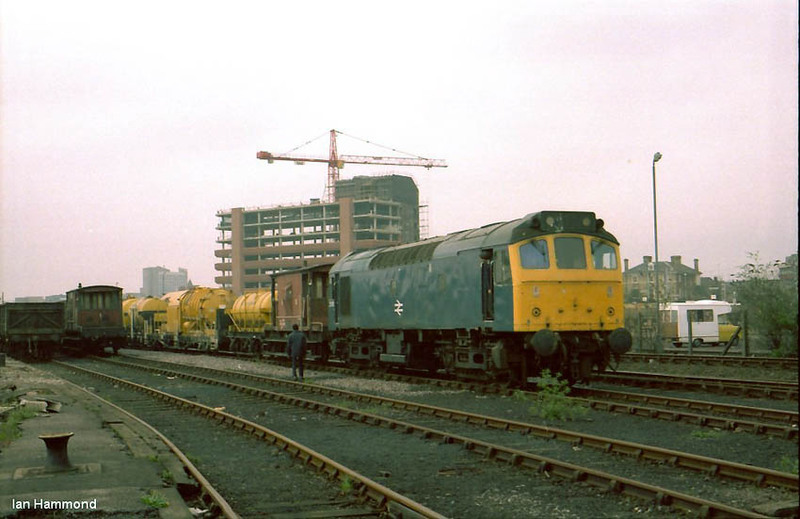 On November 17th 25195 worked the afternoon Manchester – Bristol parcels. 25195 was stabled at Severn Tunnel Junction on December 16th. The 12.05 Bedford - Bletchley was worked by 25195 on January 5th 1985. Three days later on a snowy January 8th 25195 was stabled at Cricklewood. On January 19th 1985 the 12.10 Liverpool - Plymouth failed at Norton Bridge behind 47535, 25195 & 25224 took over but 25224 was failed and removed at Stafford leaving 25195 to soldier on alone to Birmingham New Street. The middle of March 1985 saw 25195 assist two failures. On March 18th the 18.21 Barrow - Liverpool failed at Ulverston behind 47529, 25195 dragged everything to Carnforth where 47060 took over. A diesel multiple unit failure the next day (19th) saw 25195 work the 18.32 Ormskirk - Preston. Another short rescue job took place on April 3rd 1985 when the 14.25 York - Plymouth failed at Washwood Heath behind 50026, the train was worked forward to Birmingham New Street by 25195. The final recorded working took place on May 25th 1985 with 25195 & 25313 working the 13.40 Aberystwyth - Wolverhampton from Shrewsbury. Photograph courtesy Ian Hammond. With the new Watford station taking shape in the background 25195 marshals its train on April 21st 1985. Only two months remain for 25195, withdrawn in June it would surrender its power unit to 25205 and its bogies to 25262. 25195 was noted passing light engine through Crewe station with two other Class 25s on June 1st. 25195 was withdrawn on June 14th 1985. Page added August 29th 2013.